Sherlock: THE FINAL PROBLEM Review | Warped Factor - Words in the Key of Geek. As a word, it carries heavy burdens. It’s the sort of word you use if you’re planning to close a book, end a series, put a big full-stop at the end of something. There are plenty of end-points, but the ‘final’ end suggests you’re going away and never coming back. There may well be a Sherlock, Series 5 – the end of The Final Problem does double duty as a potential resetting of scenes, with Holmes and Watson as the final resource of the desperate, there in 221b Baker Street, or as a wrap-up that could leave them there preserved in amber and our memories, allowing us to have the pleasure and the responsibility of imagining their adventures from this point on. But when you call a series finale (or indeed a short story) The Final Problem, you put a series of demands on yourself – you need to be able to leave it alone by the end of the episode. You need to satisfy both dewy-eyed fans and hard-assed logicians. You need to enrich what we know about the characters, what we understand about their dynamics and relationships. You need to take us on a nerve-shredding roller-coaster ride. And you need to leave us in a place where we, metaphorically, push away from the table, satisfied, full but not bloated, and smiling at what we’ve just received. On those grounds, The Final Problem is a signal success. If they wanted to, Moffat and Gatiss could leave Sherlock there and have it feel like a complete adventure. But equally, it’d be the easiest thing in the world, dramatically speaking, to pick up the threads in Series 5. 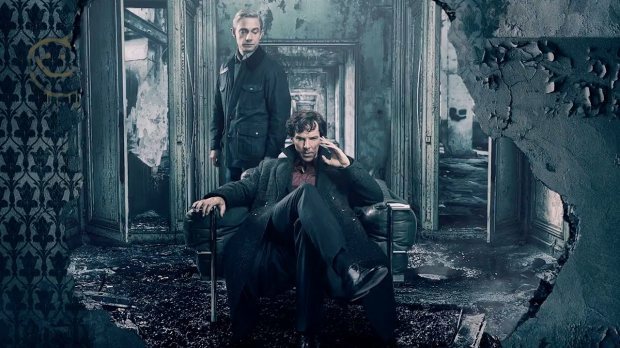 The plot is thoroughly modern – it’s a Sherlock horror movie, both in the effective if cheap scares of the pre-credits sequence, and the rest of the episode, which is essentially Sherlock Meets the Saw movies, with a little Silence of the Lambs swirled through for dark psychological tension. A deserted prison fortress, run by an inquisitive psycho, determined, as Sherlock puts it, to perform a series of science experiments with human lab rats. People will die along the way, both innocent and guilty. People’s hearts and lives will be broken, at least one of them by Sherlock himself. But this is a maze with context at every turn. Eurus, the ‘forgotten Holmes’ invented by Moffat and Gatiss to throw some shocks and creativity into Series 4, gives us new insight into the Holmes boys we know all along the line, her childhood brilliance marked with a scientific amorality. Whereas Moriarty was a quixotic, playful, emotional genius, Eurus feels like she’s above the petty moralities of human beings, with a mind so brilliant it’s painful, and trying to teach Sherlock along the way that his emotional engagement with the world is what stops him achieving the brilliance of either of his siblings, but actually, crucially, allowing him, with the uncovering of secrets and a mystery from his youth, to prove that the emotional element, and particularly his connection to other ‘ordinary’ people is actually what allows him to be a better human being than either of his siblings, and what allows him to reach Eurus when no-one else can. The biggest reveal along the way also shows us a crucial point in this Sherlock’s history, and brings us pretty much full circle from A Study In Pink – the high-functioning sociopath who was merely a great man at the beginning of his journey is revealed to us as a reasonably emotional child who suffered an appalling tragedy, blocking out some memories, rewriting some others, and becoming more like the only sibling he remembered, like Mycroft, in an attempt to uncomplicate his emotional life. At the end of this episode, Lestrade revisits his original estimation of the younger Holmes boy – he’s no longer just a great man, he’s better than that. He’s a good man. There’s been much talk from the writers about the realisation that what Sherlock, Series 1-4 has actually been is a kind of prequel, a backstory to the original Sherlock Holmes stories, a long preparation sequence for the Holmes that Conan Doyle wrote, who, while incisive and deductively brilliant and very different from the masses of humanity outside his doors, was never especially sociopathic, who always took account of the human factor in his cases, and who seemed to have a fierce understanding of ‘right.’ That makes some sense after this episode, in which someone – his mother, no less – describes Sherlock as always having been ‘the grown-up one,’ while labelling Mycroft the ‘idiot child.’ We can see, after this episode, how the characters could evolve in the way that Conan Doyle writes them – Holmes and Watson in the flat on Baker Street, having adventures, Mycroft increasingly retreating from the world of humans after having got things so badly wrong, letting his predilection for gluttony overtake him, the demons of Moriarty and his gang finally behind a world he was never keen on. So The Final Problem is a kind of acid test of how far Sherlock Holmes has come, a dealing with the final remaining ghosts and blocks in his memory that prevent him being a fully rounded person? Sure, you can read it that way, and constructed as such, it delivers its premise, its resolution and its emotional satisfaction. It's also essentially still a locked-room mystery though, the miniature puzzles along the way more cruel than especially demanding – there’s a sense that they wouldn’t, in terms of their complexity, be out of place in a 21st century ‘escape room,’ rather than being fit for the mind of the world’s only consulting detective. The puzzles are more about Sherlock’s emotional responses than his intellectual ones – will he send a guilty man plummeting to his death? Will he react when innocents are killed? What about when he has to be heartlessly cruel to a woman that loves him unconditionally? Or when his latest ‘pet’ is about to die. With three simultaneous puzzles to solve, two of them resulting in people’s deaths, what will Sherlock Holmes decide to prioritise? His choice is what makes him a ‘good’ man – his synthesis of intellect and emotion finally able to work for him, rather than acting as either a war in his head or a disability. The Final Problem of which life to prioritise is, after so many others have died and suffered, a way for Sherlock to ‘get it right’ on some childish level, and so unlock the man that he could be – arguably the man he always should have become. All of which leads us to the question of whether The Final Problem actually works. Wellllll, yes and no. Yes, it does everything we’ve said it does: gives us a tense ‘locked-room’ mystery, with science from the point of view of the white mice; acts as a Sherlock horror movie, where innocents have to be sacrificed in order for the ‘fittest’ to survive; delivers its psychological shocks and lessons, and rounds off the first four series with breakthroughs, a kind of forgiveness, and a shifting of the paradigm of Sherlock’s life as we’ve known it towards something more recognisable from the Conan Doyle originals. Does it work as a ‘final problem’? Yes, it does. That said, as a piece of TV drama, it’s less consistently intoxicating than, say, episode 4.2, because Eurus, while possessed of a great backstory, is rendered like an almost-exhausted psychopath by Sian Brooke, the slightly washed-out sing-song voice effectively giving the sense of being ‘above’ all the tedious moralising of ordinary humans, but that very distance making Eurus seem both powerful and somehow trivial at the same time. The puzzles and traps are mostly guessable, because of their intended importance as psychological testers, rather than intellectual crimes, and the somewhat tacked-on summation by Mary Watson has the feeling of a team determined to hedge their bets and put a big finale on the end of their four year journey, in a way made necessary for instance at the end of The Sarah-Jane Adventures by the death of Elisabeth Sladen, but here feeling like an odd epilogue in the event of there being a Series 5. In essence, while it delivers a tense, psychological horror-thriller which resolves a lot of personality issues about our consulting detective, and ties up the thread of ‘Moriarty’s return,’ once it’s done, it feels very much done, rather than necessarily staying with you for any length of time, as episode 4.2 probably did. So does it work? Yes, as everything it was designed to be. But is it the best episode of Series 4? Not by some way. It works, absolutely, but it works as pure theatrical entertainment, rather than as any reflection of either the real 21st century in which it’s set, or the thrilling Victorian detective stories on which it’s based. As such, it’s less effective than The Lying Detective, which remains the highlight of Series 4.